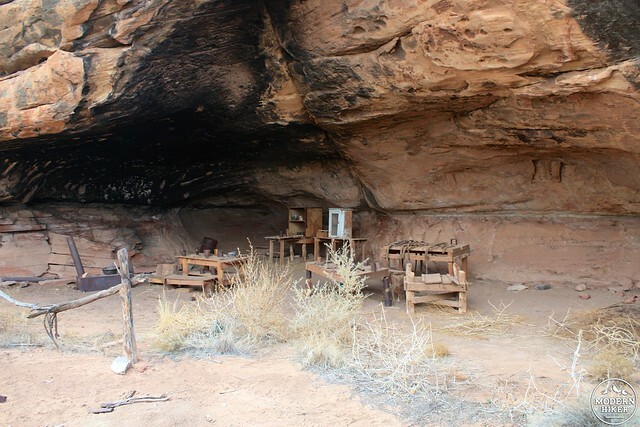 Cave Spring is a short, relatively easy trail in the Needles District that will give you an idea of the region’s ancient and modern history as well as a surprisingly great spot to take in the full vastness of the Canyonlands. The trail begins at the end of a short section of dirt road that’s easily navigated by 2WD vehicles (inclement weather notwithstanding). From the parking area, head in a clockwise direction. 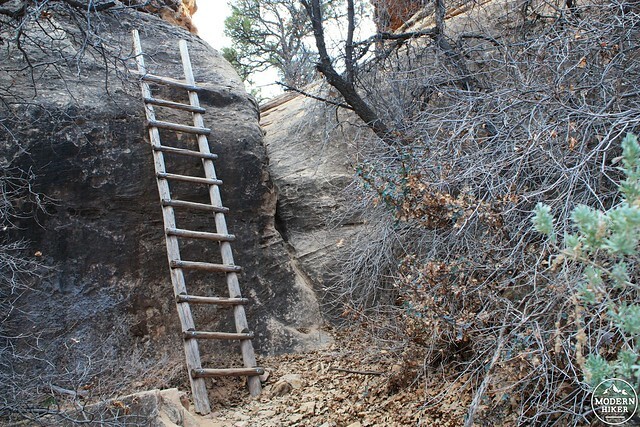 This route will give you quick and easy access to the old cowboy camp and pictographs and the option to turn around if you’re not OK with climbing two old wooden ladders to get to the top of the rock formation. 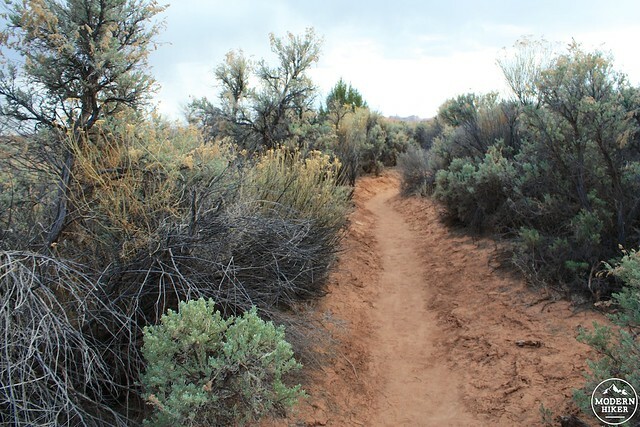 The trail begins on some well-worn single track that passes through some fragrant and beautiful Colorado Plateau chaparral and in less than a tenth of a mile you’ll come across your first glimpse of the old cowboy camp. In the late 1800s, sheep and cattle could graze just about anywhere they wanted in this part of the country – but the remoteness meant that ranchers and herders had to stay with their livestock. 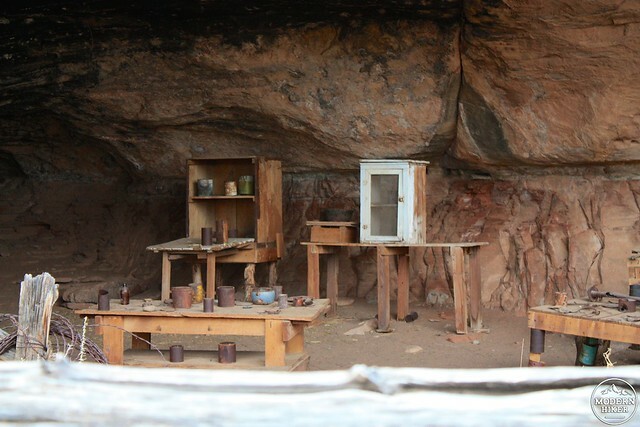 As a result, camps sprung up around the Colorado Plateau, especially where a reliable source of water could be found. 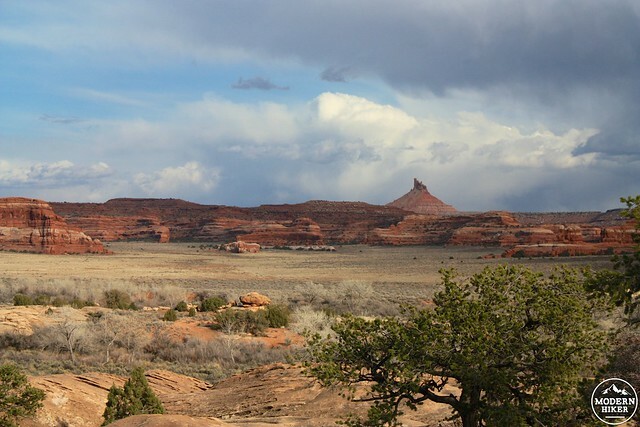 Indeed, most of Canyonlands National Park was used for ranching or grazing before the area was made into a National Park in 1964, and many of the old ranchers’ names can be found in the names of peaks, valleys, and trails today. 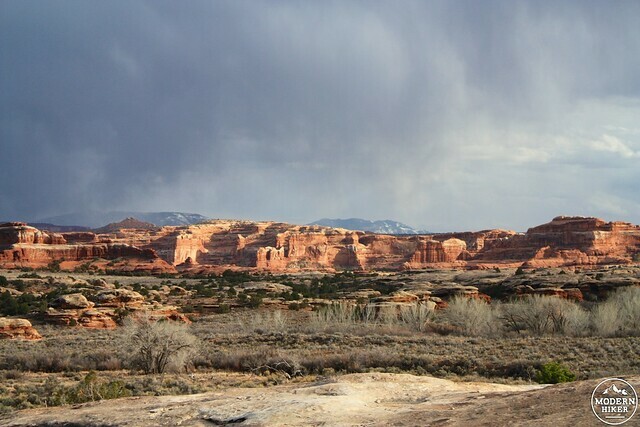 The Island in the Sky District’s Shafer Canyon was named for a herder there, but here in the Needles District the largest operators were the ranchers Don Cooper, Mel Turner, D.L. Goudelock, and Joe Titus, whose combined holdings were sold to the Indian Creek Cattle Company. 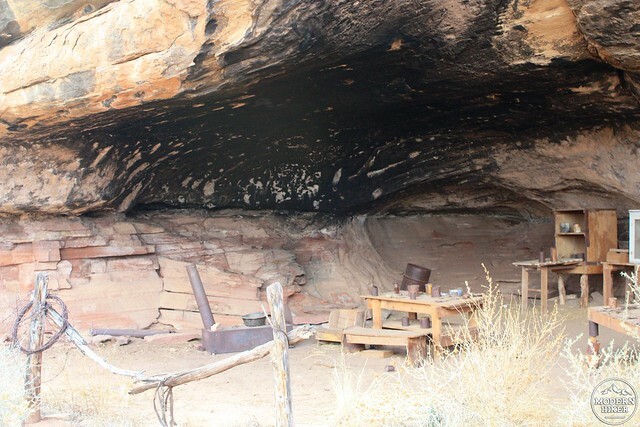 Indian Creek had its headquarters just east of the Needles District but used the camp at Cave Springs as an important waypoint. Today, the Indian Creek Cattle Company is still headquartered east of the Needles District but is managed by the Nature Conservancy (you drove through their land on the way in!). After you pass the cooking and sleeping area of Cave Spring Camp, the trail hugs the side of the rock formation and turns a corner to present Cave Spring itself. 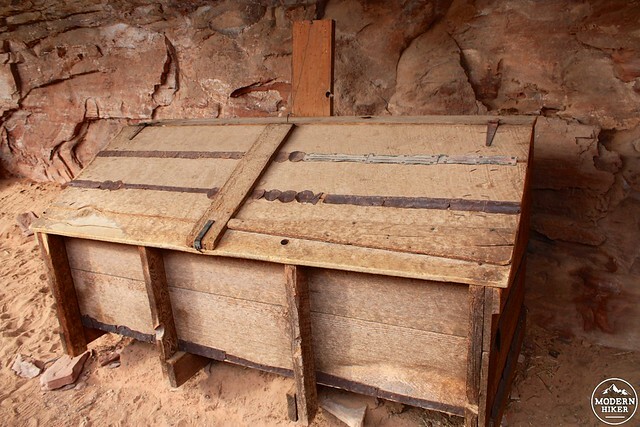 You’ll note signs of habitation in this area as well – both in old wooden storage bins used by the cowboys – and handprints and pictographs left much earlier by Native Americans near the spring. 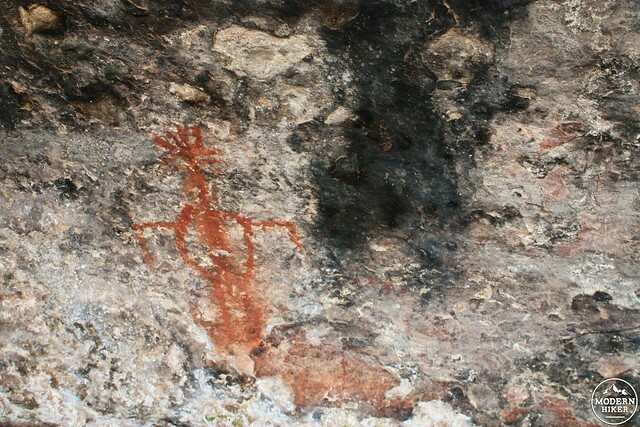 Even if all this hike had was a short trip to an old cowboy camp and pictographs, it would still be worth visiting – but after you pass the camp and Cave Spring, the trail becomes something completely different. 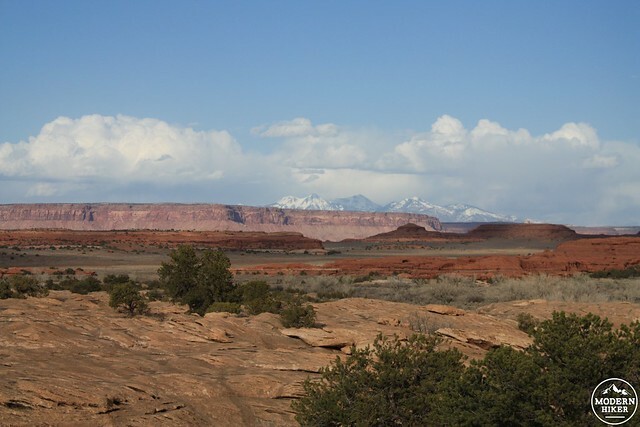 To the east, you’ll be able to make out the distant La Sal Mountains and North and South Six-Shooter Peaks (the two eroded mesas that only have tiny spires reaching to the skies now). 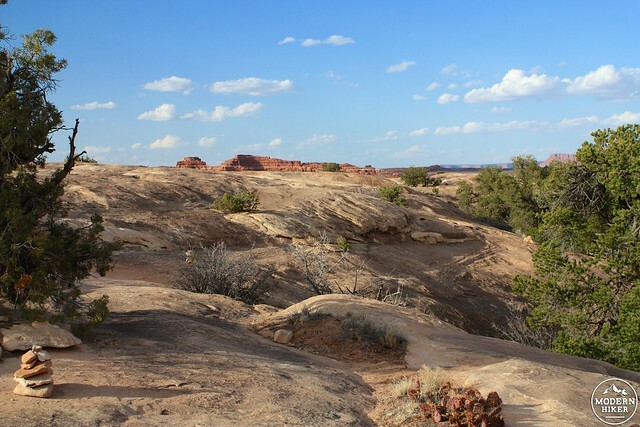 To the west, you’ll see the strange melted-rock forms that make up Elephant Canyon and the Chesler Park area. 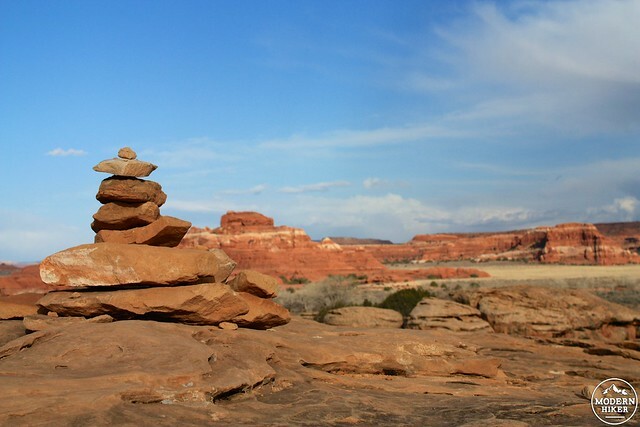 All in all, it’s an awe-inspiring view that you wouldn’t expect on such an easy, uncrowded trail – but that’s Canyonlands for you! Atop the small mesa of Cave Spring, the trail makes its way marked by cairns before gently dropping you back off at ground level. If this was one of your first stops in the Needles District, chances are it’s only going to make you hungry for more. Good. 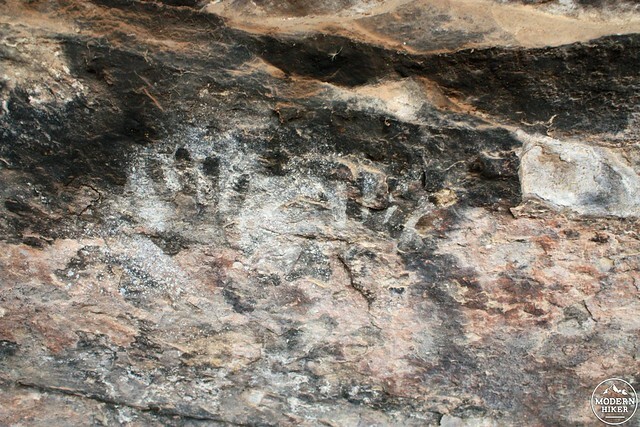 There is a clear dirt trail leading around the rock formation, and to get on top of the formation you'll have to climb up a ladder. 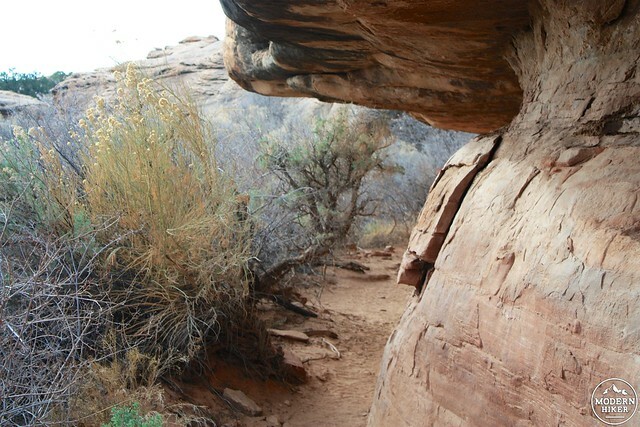 Atop the "cave," the trail is slickrock and marked with cairns. From Monticello, UT, head north on US-191 for 14.4 miles then take a left onto UT-211 West. Stay on this road for 35.1 miles (paying the entrance fee at the National Park boundary) then turn left onto Cave Spring Road. After 0.7 miles, turn left at the junction onto a dirt road (2WD passenger clearance OK most times of year). Ignore the turnoff to Salt Creek Road at 0.8 miles and drive the last two tenths of a mile to the parking area at Cave Spring. Our family just hiked this great little trails. Lots of fascinating things to see on a varied terrain. Definitely a great choice for little kids. There is a ladder to climb, but it is pretty short so parents can be vigilant of little bodies going up.